The earth and its landforms that we see today have evolved over a very long time. Current estimation shows that the earth is approximately 460 million years old. Over these long years, it has undergone many changes brought about primarily by the endogenic and exogenic forces. These forces have played a significant role in giving shape to various surface and subsurface features of the earth. Indian plate was much larger in size and the Australian plate was a part of it? 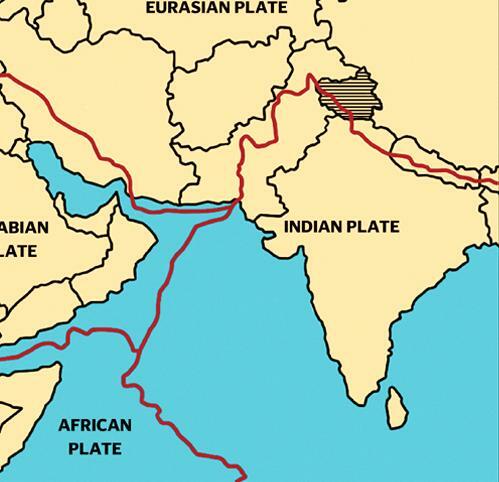 Over millions of years, Indian plate broke into many parts and the Australian plate moved towards the southeastern direction and the Indian plate to the north. This northward movement of the Indian plate is still continuing and it has significant consequences on the physical environment of the Indian subcontinent. It is primarily through the interplay of these endogenic and exogenic forces and lateral movements of the plates that the present geological structure and geomorphologic processes active in the Indian subcontinent came into existence.